The Siberian Crane was last seen at Mai Po on the morning of April 1st. The Deep Bay mud flats (and the scrape on the main reserve at high tide) were alive with a variety of waders during the first few days of April when the tides were excellent for observing the birds. The first Asian Dowitcher was noted on the scrape on April 1st with two there on 2nd and 3rd. Nordmann’s Greenshank numbers rose from five on 1st to 17 on 3rd. Two hundred and thirty Great Knots were counted on April 1st. At least five Far Eastern Curlews were present on 2nd. Up to two Grey-headed Lapwings and five Oriental Pratincoles frequented the scrape from 1st to 4th. A Long-billed Dowitcher and a Ruff were seen on 3rd. The first Sharp-tailed Sandpiper was noted on 1st and the first Long-toed Stints on 5th. Gull numbers were notably lower than during the winter, although 161 Heuglin’s Gulls were counted on 3rd. Up to two Saunders’s Gulls remained until at least April 5th. Other gulls noted were single Black-tailed Gulls on 2nd and 5th, and a Pallas’s Gull and two mongolicus Caspian Gulls on 3rd. Caspian and Gull-billed Terns were much in evidence with 18 of the former and 255 of the latter noted on 3rd. Three Little Terns were out on the mud flats on 4th and a Whiskered Tern was there on 5th. The first Striated Heron of the season was noted on 1st, and the first Swinhoe’s Egret on 3rd. Other birds of interest were a Styan’s Grasshopper Warbler singing along the boardwalk and a Chestnut-collared Yuhina and Chestnut-winged Cuckoo elsewhere on the reserve on 1st. Six Japanese Sparrowhawks and three Besras were seen migrating over the reserve on 5th. A Japanese Sparrowhawk was at Long Valley on 2nd, although this area was generally quiet during the period under review. Apart from Mai Po, Po Toi was perhaps the site most frequently visited by keen birders – although access is limited by ferry sailings (no boats on Mondays, Wednesdays & Fridays). The Maroon Oriole was still present on 1st and at least nine Streaked Shearwaters were seen from the ferry – an unusual event. A Lesser Frigatebird was seen on 2nd. Highlights of 4th were two Grey-faced Buzzards, a Brambling, a Japanese Sparrowhawk, three Crested Goshawks and a Daurian Redstart but no flycatchers were recorded. Indicative of the rapid changeover of migrants at this time of the year, the 6th turned up Narcissus, Blue-and-white, Ferruginous & Asian Brown Flycatchers, a Siberian Blue Robin, and a Hoopoe and on 8th there were three Narcissus Flycatchers, a Blue-and-white Flycatcher and a Tristram’s Bunting. A Chestnut-cheeked Starling was seen on 9th. Seawatching from the tip of the southwest peninsula at Po Toi on 8th turned up 6 Aleutian and 5 Greater Crested Terns as well as an Ancient Murrelet and a Long-tailed Jaeger. Two Pomarine Jaegers were also seen from a boat near Po Toi on the same day and another Long-tailed Jaeger was noted near the Ninepins. An HKBWS boat trip and a different independent boat trip to southern and southeastern waters on 9th proved very productive with provisional counts (courtesy of Richard Lewthwaite & Carrie Ma) of at least 55 Long-tailed Jaegers, six Pomarine Jaegers, four Parasitic Jaegers, 20+ unidentified Jaegers, 11 Greater Crested Terns, three Aleutian Terns, 14 Gull-billed Terns and c. 170+ Red-necked Phalaropes. Birds of note at Tai Po Kau were Narcissus Flycatcher and a dark-form Crested Honey Buzzard on 1st, Narcissus Flycatcher and Chestnut-flanked White-eye on 2nd, and a different dark-form Crested Honey Buzzard on 4th. Four male Hainan Blue Flycatchers, two of them accompanied by females, were holding territories along the red walk on 10th and there were reports of Brown-breasted Flycatcher two days earlier on 8th. Cheung Chau had a Hoopoe on 1st and the first Indian Cuckoo of the season on 7th. San Tin fish ponds were very productive on 6th, with a variety of waders on a few drained ponds including two Oriental Plovers and 15 Oriental Pratincoles. Also recorded were seven Whiskered Terns, three Blue-tailed Bee-eaters, several Sand (Pale) Martins, a Citrine Wagtail and two Little Buntings. Two Oriental Plovers, two Oriental Pratincoles and 18 Long-toed Stints were present on 10th. For diverse reasons, the age of digital photography has led to interesting records sometimes coming to light after the bird has flown, although perhaps few as long gone as the Desert Wheatear photographed at Chek Lap Kok airport on February 19th, 2013! More recently, there was late news of a Small Pratincole photographed at San Tin on April 4th. Both the wheatear and the pratincole will be firsts for Hong Kong if accepted by the Records Committee. Another interesting wader was photographed at Mai Po on April 4th. This bird seems to be a hybrid between a Curlew Sandpiper and a Pectoral Sandpiper (a form known as Cox’s Sandpiper) coming into breeding plumage. For pictures and ensuing discussion, see http://www.hkbws.org.hk/BBS/redirect.php?tid=26358&goto=lastpost#lastpost . And so back to the period under review: the unsettled weather at the beginning brought a variety of migrants to the territory. 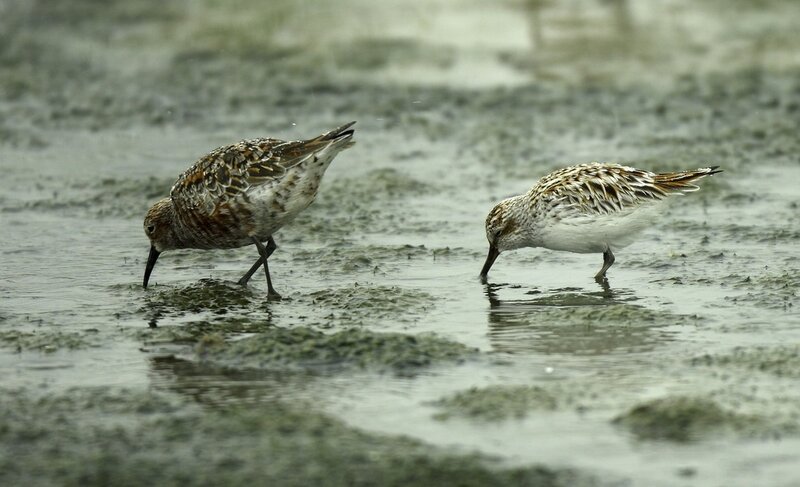 On April 11th, Mai Po had 418 Gull-billed Terns, 1100 Black-tailed Godwits, nine Nordmann’s Greenshanks, four Far Eastern Curlews, two Grey-tailed Tattlers, the first of the spring, and a Little Stint. Further reports from Mai Po included, a Brown-headed Gull in breeding plumage on 15th and a stunning male Pied Harrier on 16th. Amongst the water birds out in Deep Bay on 17th were two Little Stints, five Nordmann’s Greenshank and a late Saunders’s Gull; an Oriental Plover was on the scrape. There were reports of passerine migrants from Chek Lap Kok airport as follows: Mugimaki, Narcissus & Blue-and-white Flycatchers, and a Black-naped Monarch on 12th; Northern Boobook, a Japanese Thrush, two Eyebrowed Thrushes, two Blue-and-white Flycatchers, a Mugimaki Flycatcher and a Black-naped Monarch on 13th. From Po Toi, three Chinese Sparrowhawks and a Japanese Sparrowhawk, Blue-and-white, Narcissus, Asian Brown & Ferruginous Flycatchers, and a Swinhoe’s Minivet were recorded on 13th, with six Grey-faced Buzzards, a Chinese Sparrowhawk, a Eurasian Woodcock, two Swinhoe’s Minivets, and eight Asian Brown & two Blue-and-white Flycatchers on the following day. Tai Po Kau turned up an Orange-headed Thrush in song, a Mugimaki Flycatcher and three Plain Flowerpeckers on 14th, Drongo, Hodgson’s Hawk & Chestnut-winged Cuckoos on 17th and a male Japanese Paradise Flycatcher on 18th. 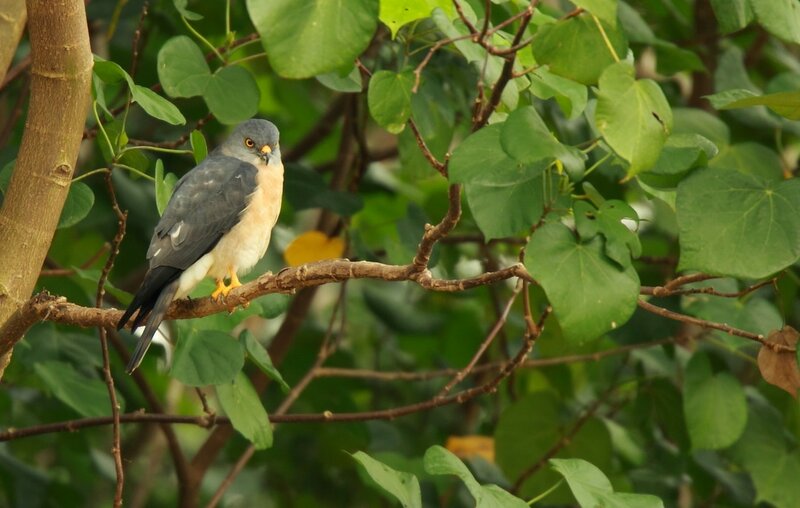 Other records of interest were a Chinese Sparrowhawk at Starling Inlet on 11th, Hodgson’s Hawk Cuckoo near Sai Kung on 12th and Lam Tsuen on 13th , Slaty-legged Crakes calling at Tai Po Kau headland and Discovery Bay on 13th and Shek Kong catchment on 14th , and four Eyebrowed Thrushes at Ng Tung Chai on 14th. A Eurasian Eagle Owl was seen at pond 11 at Mai Po from 13th onwards, but was in poor condition so was taken into care by the SPCA on 20th. The weather turned stormy on 21st. Nine Blue-tailed Bee-eaters passed through Palm Springs in the late afternoon and a further 24 were noted nearby a little later. At the Mai Po boardwalk a Swinhoe’s Egret and a Little Stint were seen, as was – more unusually – a Citrine Wagtail. Sixteen Oriental Pratincoles were recorded at Chek Lap Kok. Unsettled weather from 22nd to 27th coincided with a number of interesting migrants seen in the territory. There were expected sightings of Oriental Dollarbirds and Grey-streaked Flycatchers from several areas and also scattered reports of Brown Shrikes and Arctic Warblers. There were also one or two rarities and a couple of enigmatic warblers. On 22nd, a female type owstoni Narcissus Flycatcher or Green-backed Flycatcher Ficedula elisae was reported from Mai Po. (On current knowledge, it is impossible to separate females and some first-summer males of these two species in the field). The Saunders’s Gull lingered at Mai Po until 23rd. On the same day, two Little Stints were seen on the mud flats, and elsewhere in the area there were 17 Blue-tailed Bee-eaters and a Himalayan Swiftlet. Ten further Blue-tailed Bee-eaters were seen at San Tin on 23rd, as was a male Yellow-breasted Bunting. The following day at San Tin, Blue-tailed Bee-eater numbers had increased to 19, and there were also sightings of six Yellow-breasted Buntings, two Chestnut Buntings and a Little Bunting. The best bird of the day, however, was a Mongolian Short-toed Lark Calandrella dukhunensis. This taxon was regarded as a subspecies of Greater Short-toed Lark Calandrella brachydactyla until it was split by the IOC last year. There are three previous accepted records of Greater Short-toed Lark in Hong Kong, but none of them are ascribed to form in the published material (although my understanding is that at least one of these records is ascribable to dukhunensis). Less rare, but still a much wished-for bird, was a Fairy Pitta that remained at Ho Man Tin from 24th until at least 29th. Also present at that site on 24th were a Japanese Paradise-Flycatcher, and Narcissus, Asian Brown & Grey-streaked Flycatchers. A Himalayan Swiftlet was at Pui O on 25th and a Pale-legged Leaf Warbler was singing at Cheung Chau on the same day. The Peak – now an under-watched site - had Narcissus, Grey-streaked & two Asian Brown Flycatchers on 28th. A boat trip out to southern waters on April 29th picked up at least five Short-tailed Shearwaters, an Arctic Jaeger, a Lesser Frigatebird, 14 Aleutian Terns and a Greater Crested Tern. The best site for passerine migrants was, as usual Po Toi, with a number of regular migrants reported on 27th and 29th, including Chinese Sparrowhawk, Japanese Paradise-Flycatcher and Chestnut Bunting on both dates. Of most interest, however, were a couple of mystery Phylloscopus warblers. On May 3rd 2016 a Phylloscopus warbler showing characteristics of Large-billed Leaf Warbler Phylloscopus magnirostris was photographed on Po Toi. See http://www.hkbws.org.hk/BBS/viewthread.php?tid=25013&highlight=warbler%2BID This species has never been recorded in Hong Kong before. Bill-shape and pattern, head pattern and leg colour point to these birds being Large-billed Leaf Warbler but some observers are skeptical, suggesting that the wing formula, as they discern it from the photographs, does not fit Large-billed. The only vocalisations heard in the vicinity of the bird so far have been of Arctic Warbler, but it is unclear whether this is from the bird in question or from migrant Arctic Warblers close by! All in all, a very interesting puzzle!